A statue of Lamassu from Mesopotamian Mithology. The “king of Assyria”,lime stone, alabaster. The figure is about 42 ft high. The statue from the British Museum is part of a set of figures from the Sumerian culture. This god often depicted as having human head, wings and the body of an ox or a lion used to be in the main entrances of the Temples to give protection. Lamassu represented the zodiacs, parent-stars and constellations. His beard supported the image of a wise God and he is always standing like a guardian. 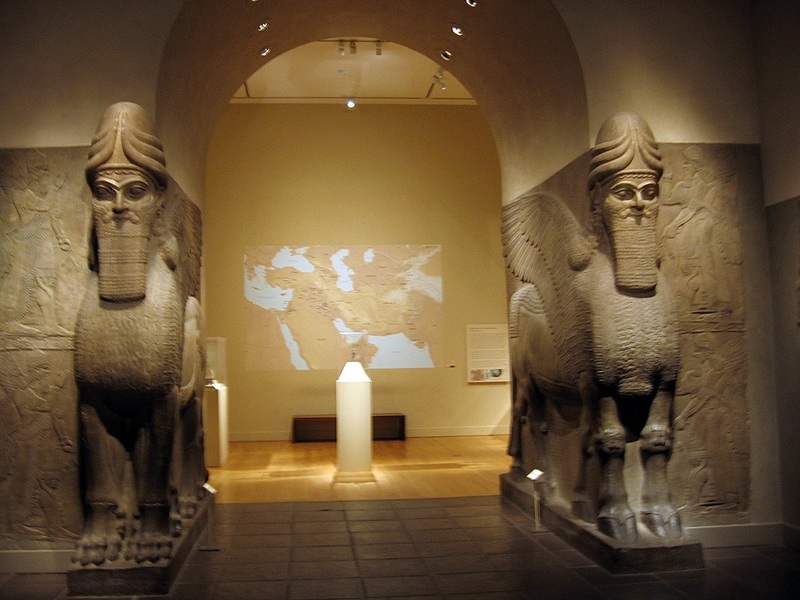 In the wall the images of Marduk.God of heaven and earth. Identified as Jupiter in the first millennium. His sacred animals were horses, dogs and dragons. On his hands generally holding a bow, spear, net or thunder bolt which represents fertility and vegetation. Sometimes Marduk is represented as a snake-dragon. Marduk became the head of the Mesopotamian pantheon in the first millennium .He was also the patron God of the City of Babylon, where is the Temple of Ziggurat. Shared by: Eugenia, Dean, Ke Xiao.